A former Governor of Oyo State, Senator Rashid Ladoja, on Saturday met Ekiti State Governor, Ayodele Fayose, in a private meeting. Emerging from the meeting, Ladoja backed the governor’s bid to contest in the 2019 presidential election on the platform of the Peoples Democratic Party. But Ladoja, while affirming that he was returning to the PDP, said that Fayose had the fundamental human rights to contest for the nation’s number one seat. “Governor Fayose is my own brother and he is a go-getter. Whatever he sets his mind to achieve, he goes for it and he gets it. He is eminently qualified and possesses all the leadership capabilities to rule Nigeria and take us out of the woods. “Some people in the PDP have said that they have zoned the presidency to the north, but it is left for Fayose to convince the members in the PDP to support him for his presidential ambition. He is fit for it judging from his antecedents as a quintessential leader in the country. Ladoja said the All Progressives Congress in Ekiti should perish the thought of taking over power from the PDP in 2018. He also expressed confidence that the PDP would take over power from APC in Oyo in 2019, saying Governor Abiola Ajimobi had lost relevance, especially, with kingship crisis. “Fayose has performed excellently well in governing Ekiti. There is no governor in this country today who can beat his chest two times and say my state came tops for two consecutive times in NECO. 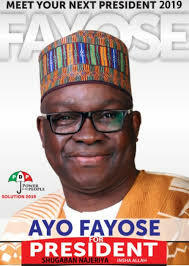 “Fayose as a political enigma cannot be uprooted in Ekiti based on his good governance, transparency and the many good projects he is embarking on in the state and which has adorned the landscape of the Fountain of Knowledge.